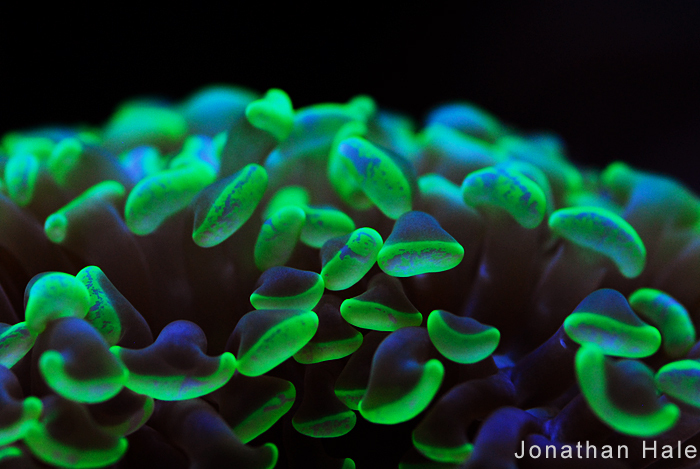 By Chris JuryIntroduction I like corals…a lot. I grow corals in aquaria for the fun of it, I propagate them, I buy, sell and trade them, and I study them professionally. I spend countless hours staring at them, daydreaming about them, and sometimes even literally dreaming about them. There’s just something about them that is wonderful and captivating. In recent years I’ve begun to take note that some shrubs, especially certain junipers and the like, bare a striking resemblance to table-top or bottle-brush Acropora. I’m not content just thinking about corals though, I also engage in particularly strange behaviors. Several years ago, upon returning home from a trip to the Caribbean, I happened to leave my dive gear sitting not too far from my aquarium… my 50 gal open-top aquarium … I recall the thought process vividly as I glanced from the aquarium to my mask and then back again. In no time flat I had found a very interesting new way to get a top-down (and close-up!) view of my tank. Honestly though, who really does these things? What kind of crack-pot feels giddy because bushes remind him of corals, or goes face first into an aquarium wearing a dive mask? Lamenting my oddness, I was prepared to take these things to the grave. I’ve come to realize, however, that I’m far from alone in my obsession (or the degree there-of). It turns out that there are other people out there who are as geeky for corals as I am. 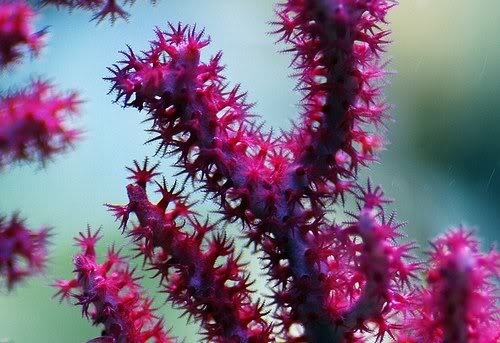 It was about the time that my girlfriend told me her ideas about “land corals” (trees and shrubs) that I thought she could be right for me. When she donned a dive skin to prevent coral stings while working in her tank, I was sure. She, and many of the best people I know are coral geeks, or more kindly, coral aficionados. If you’re reading this, you might even be one of us! Instead of shunning these tendencies I’ve decided to revel in them. Besides, these admissions are now in print and there will be no taking them back at this point! In this article I will discuss a bit about what it means to be a coral—what corals are, where they came from, and what they are not. What is a “coral” anyway? All of the animals that we call corals belong to the phylum cnidaria (the “c” is silent, NYE-dare-EE-uh), along with a great many animals that we call something else entirely. The distinguishing characteristic of the phylum cnidaria is the cnidocyte (aka nematocyst), specialized stinging cells used to capture and kill prey, and for defense. Cnidarians sting. While some have very mild stings, others can leave quite a welt on some people (hence Tahl’s use of a dive skin) and some species can even be deadly with sufficient contact (e.g., certain box jellies). Within the phylum are four classes: scyphozoa, cubozoa, hydrozoa, and anthozoa. The scyphozoans are typical jellyfish while the cubozoans are box jellies and sea wasps. All the animals we call corals are contained within the remaining two classes (hydrozoa and anthozoa). The hydrozoans are a highly diverse group ranging from freshwater Hydra (you may have been entranced by them in high school biology, I know I was) to the Portuguese Man o’ War. They include solitary and colonial species, some of which produce hard skeletons, many of which do not. 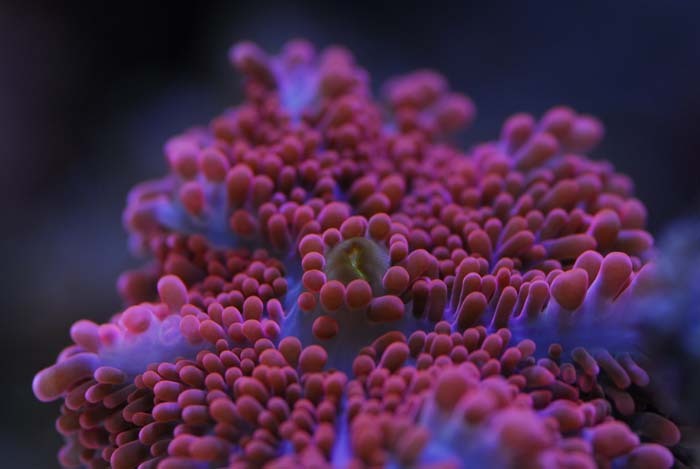 Included in the hydrozoa are the infamous fire corals (Millepora spp.). If you’ve ever bumped into them accidentally, especially with a sensitive bit of skin, you know exactly how they get their name. Fire corals have a fairly potent sting that, while not really dangerous to most people, sure does hurt. Fire corals can be important components of the coral cover on many reefs in nature and all harbor symbiotic zooxanthellae. While not as common in captivity as many corals, fire corals tend to grow very well in good conditions (especially with bright light and strong flow) and can be absolutely lovely additions to aquaria. Also within the hydrozoa are the beautiful, but unfortunately delicate, lace corals (Distichopora and Stylaster spp.). While they are some of the most beautiful corals one might hope to keep in an aquarium, the fact that they are not symbiotic and therefore need large amounts of small particulate food makes them all but impossible to maintain in captivity at present. Our ability to provide appropriate food to organisms like these will have to improve vastly before we will have a chance of success with them. All the other animals we call corals belong to the class anthozoa. Anthozoans are split into two subclasses: the octocorallia and the hexacorallia. Let us consider the octocorals first. The prefix octo- stands for “eight”, of course, and octocorals are characterized by having an internal structure based on eight subdivisions. Octocorals also have eight tentacles on each of their polyps. The subclass is divided into three orders: the pennatulacea (sea pens), helioporacea (the Blue coral,Heliopora coerulea), and alcyonacea (soft corals and gorgonians). While the Blue coral is decidedly not a soft coral, producing a sturdy skeleton, other octocorals (including the softest of the soft corals) produce at least some sorts of skeletal structures. Soft corals, such as the leather corals (Sarcophyton, Sinularia, Lobophytum, etc. ), come ckock full of calcium carbonate spicules. Gorgonians are thick with proteinaceous rods and sometimes calcium carbonate spicules too. Even comparatively very soft soft corals such as the xeniids (Xenia, Anthelia, etc.) are full of spicules, don’t let the common name fool you. While octocorals have an internal symmetry based on eight subdivisions, the hexacorals have an internal structure based on multiples of six (six, 12, 24, etc.). The subclass hexacorallia is divided into six orders: ceriantharia (tube anemones or cerianthids), antipatharia (black corals), actinaria (sea anemones), zoantharia (zoanthids), corallimorpharia (mushroom polyps or corallimorphs), and scleractinia (stony corals). While black corals are often collected for the jewelry trade they are rarely available to aquarists. Given that they are aposymbiotic and therefore require all of their nutrition to be delivered through feeding, it’s probably for the best that they aren’t more available. The last group, the scleractinians or stony corals, are what we usually mean when we use the term “coral.” One thing that may now be apparent is the degree to which the term “coral” is polyphyletic, meaning that it is meant to include a hodge podge of distantly related organisms, but excludes many of their relatives. If we are going to call stony corals “corals” and black corals “corals”, why don’t we call close relatives of theirs like mushroom polyps, zoanthids, and sea anemones “corals” too? Who knows? Ancient Lineages and Naked Corals The scleractinians have been the major reef-building corals (though not the only reef-building organisms) since the Triassic some 240 million years ago (Mya). There isn’t clear fossil evidence of scleractinian corals before this time, but coral reefs had been growing and declining on planet Earth for nearly 250 million years prior to the appearance of the scleractinians. For hundreds of millions of years two other orders of hexacoral ruled the roost in terms of contributing to reef formation. These two were the rugosa (horn or rugose corals) and the tabulata (tabulate corals). These corals built extensive reefs at times, and nearly disappeared at others. By the Permian period, about 300 Mya, both had declined substantially, and while still very much around and kicking, were not nearly the reef-builders they had once been. The Permian ended with the largest extinction event the planet has ever experienced: upwards of 70% of terrestrial species and 90-95% of all marine species went extinct. Included in the marine extinctions were the rugose and tabulate corals. Though they had survived several global mass extinction events in their long history, and had risen to dominate the tropical seas at times, they were not immune to the end-Permian extinction. And so the world persisted, for millions of years, without coral reefs. The rugose and tabulate corals were gone, and the scleractinians were not yet on the reef-building scene. There have been many periods of reef-building in Earth’s history, and many periods when no reefs were built at all (“reef gaps”). Scleractinian corals have survived several reef gaps, as have many of their relatives. Reef gaps might (might occur or do occur? )occur for a variety of reasons; suffice to say that the environment is not conducive to the rapid calcification and growth of the possible mix of reef-builders that are around. It’s just not a good time to be a calcifying critter during one of these periods. How, then, have any of the scleractinians, the stony corals the build today’s coral reefs, made it through reef gaps at all? One possibility that has been suggested is the so-called Naked Coral Hypothesis — that some calicifying lineages have survived during times when it was difficult to calcify — either by not calcifying at all, or by significantly reducing the degree of calcification. Stony corals without skeletons would then be naked…naked corals. Not only would they be naked corals, they would look a heck of a lot like mushroom polyps. At one time it was suggested that the scleractinians may have simply evolved from the rugosans, but given some very fundamental differences in their body plans, it seems quite unlikely. 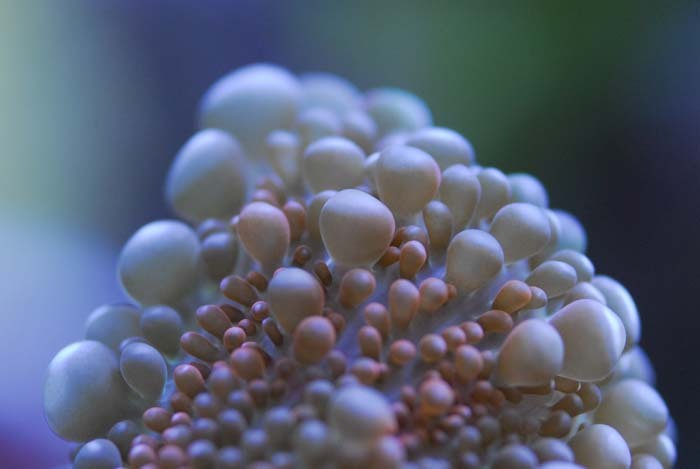 Instead, what people have noticed for many years is that the internal structures of mushroom polyps and those of stony corals are nearly identical to each other. Mushroom polyps almost appear to be stony corals that simply don’t produce skeletons! To test this hypothesis, Medina et al. (2006) looked to molecular biology to help sort out relatedness amongst a variety of stony corals and mushroom polyps, utilizing sea anemones and an octocoral as sister groups. Low and behold, the mushroom polyps lie smack in the middle of the stony coral family tree. 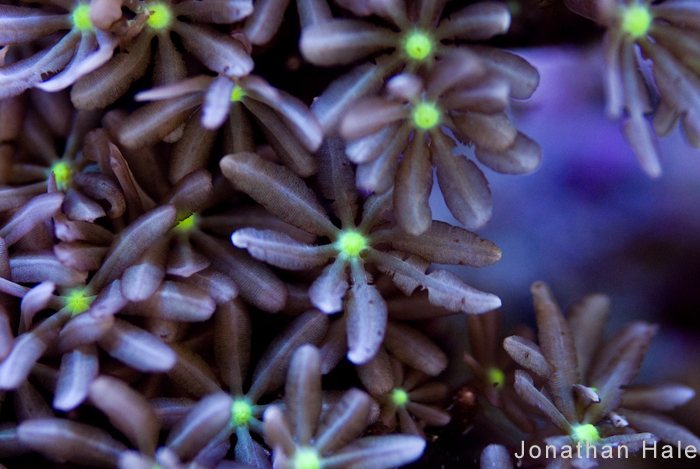 Mushroom polyps really are stony corals…just naked ones. The Acropora or Pavona you might have in your aquarium are closer relatives to Ricordea or Discosoma than either is to Lobophyllia, for example. Medina et al. (2006) were also able to estimate the divergence and thereby origin of stony corals and mushroom polyps. Stony corals first became distinct from other anthozoans on the order of 265 Mya, not too far off from the first known fossil appearance 240 Mya. The mushroom polyps first appeared on the order of 87 Mya, during the middle of the Cretaceous period. Sure enough, this was a period when scleractinian corals were far less prolific than they had been at other times, or than they have been in more recent times. It seems like ditching a skeleton and going au naturale, so to speak, had its advantages for at least one group of stony corals—the ones that became mushroom polyps. When is an SPS not an SPS? The organisms we call corals represent the end points of ancient lineages. Scleractinian corals came to dominate the seas at the same time that the dinosaurs were coming to dominate the land. Though knocked back significantly by the extinction event at the end of the Cretaceous (that killed the dinosaurs and much of the rest of life on Earth) corals squeaked through, eventually repopulating the world and building reefs several million years later. Since their origination, they have survived dozens of sea level changes, huge changes in climate (albeit most of them extremely gradual changes on human timescales), extinction events, shifting currents, shifting landmasses, shifting dispersal routes, shifting patterns of gene flow, and myriad other pressures. Through these environmental pressures, they have diversified into a tremendous array of species. Stony corals can be found from the poles to the tropics, with and without zooanthellae, with gigantic polyps nearly a foot across, or with tiny polyps barely 1 mm across. Some of them can even be found without skeletons at all—as above, we call them mushroom polyps (corallimorphs). In the hobby we tend to divide stony corals into two general classifications: SPS, or small-polyped stony corals, and LPS, or large-polyped stony corals. The important part of this scheme comes in when we think about how to care for these animals, and what to expect when we have them in captivity. It’s not at all unusual to hear something along the lines of, “SPS need bright light,” or “SPS need a lot of flow,” or “LPS need to be fed but SPS don’t.” Considering the long evolutionary histories of all of these animals and the sheer diversity of the group may give us some inkling that deciding our husbandry practices based on a single characteristic is perhaps none too wise. Let us consider just a pair of examples of when and why ‘an SPS may not be an SPS.’ At the southern tip of Baja California is a small town called La Paz. Around La Paz two coral species tend to dominate the local reefs: Pocillopora verrucosa, a coral commonly grown in aquaria, and Pavona gigantea, a close relative of common aquarium corals. 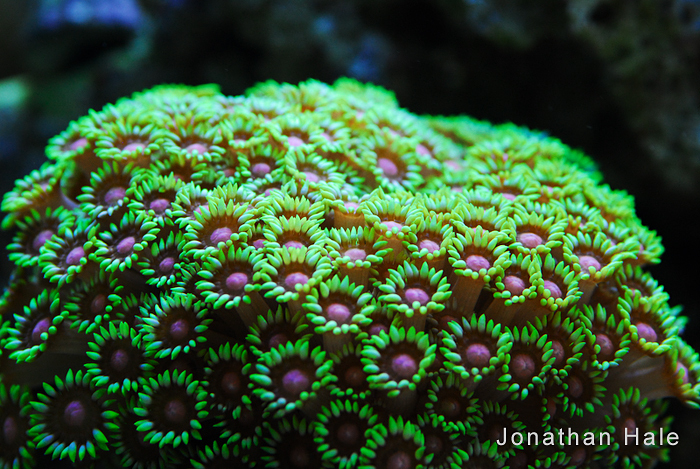 By almost anyone’s standards, both of these corals would be classified as classic SPS corals. In captivity they’d probably be given bright light by most people because…well, because they’re SPS. Around La Paz and many of the reefs in the Gulf of California not only are the reefs dominated by just two coral species, there is also clear vertical zonation. The Pocillopora dominates in the upper 6 m (20 ft) while the Pavona dominates from 6-14 m (20-46 ft) depth. This general pattern of Pocillopora in the shallows and Pavona in deeper water is in fact common throughout the Eastern Pacific. Iglesias-Prieto et al. (2004) investigated this intriguing system in an attempt to determine if differences in photobiology could help explain this pattern of zonation. Sure enough, photobiology can explain the pattern. These two corals (Po. verrucosa and Pa. gigantea) host very distinct types of zooxanthellae. At one time people assumed that the zooxanthellae in corals, clams, forams, etc. were all the same species, or represented just a few species at most. We know nowadays that nothing could be further from the truth. 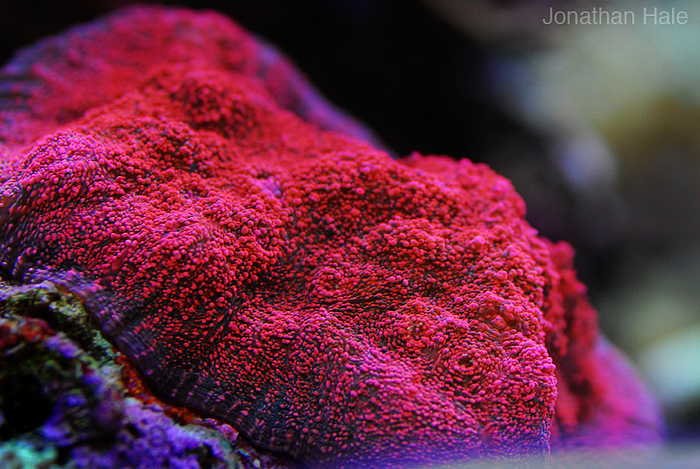 Zooxanthellae are extremely diverse, with perhaps hundreds of different species hosted by corals, clams, forams, etc., and many associations being quite specific (i.e., a certain species of coral will tend to only host a very few types of zooxanthellae, and not others). The zooxanthellae hosted by Po. verrucosa and Pa. gigantea in this system are, physiologically, something like the equivalents of Azaleas and ferns. 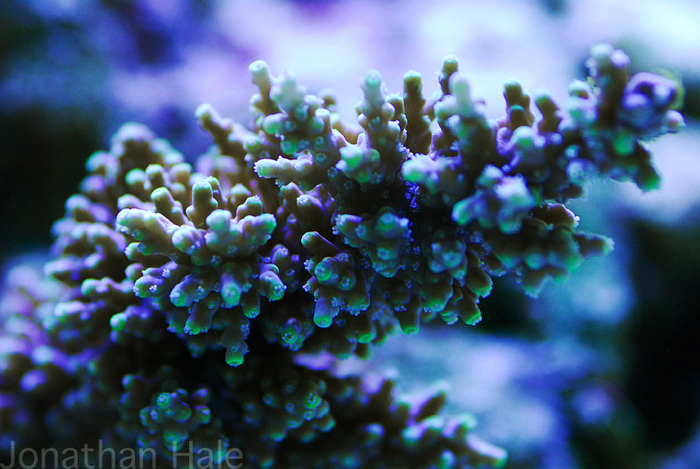 Those in the Pocillopora thrive in bright light, and can toleratereally bright light before they incur significant photodamage. 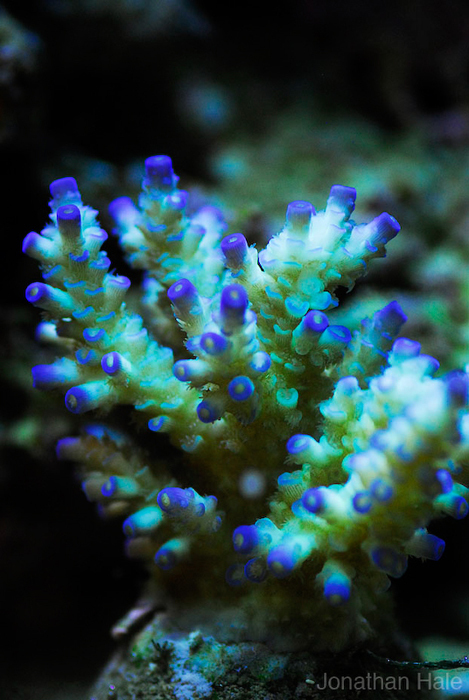 Those found in thePavona operate much better in what we might consider medium intensity light, and they get absolutely fried by high intensity light, like what the Pocillopora thrive in. If you transplant them from one environment to the other, as Iglesias-Prieto et al. (2004) did, the Pavona partially bleach, and generally do very poorly in the high-light shallows. 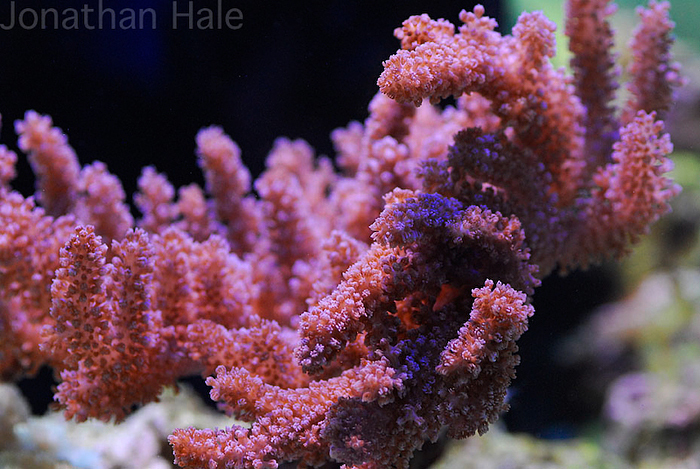 The Pocillopora starve for lack of light and do very poorly in the lower-light deeper reef. These two corals, both SPS, respond very differently to light intensity based in part on hosting different algal symbionts, and these differences help create distinct ecological niches for the two in the Eastern Pacific. Just a few coral species also dominate much of Kane’ohe Bay, Hawaii, on O’ahu’s North Shore. The two most abundant are Porites compressa and Montipora capitata, which can and do build entire reefs in the bay growing side-by-side or literally right over the top of each other. These two, again, fit the classical description of SPS coral perfectly, and are very similar to the Porites or Montipora we may keep in captivity. Under normal circumstances neither coral is a particularly aggressive predator. Both catch and eat zooplankton (which contributes ~10-20% of the corals’ daily energy demands), but neither is a particularly voracious predator (Grottoli et al., 2006). What is really interesting is what happens when these corals bleach. The Porites doesn’t really change anything in terms of feeding. It continues to feed at a low rate, bleached or not, and uses up its fat reserves as it slowly starves waiting for the food its bleached zooxanthellae cannot give it. If the zooxanthellae recover in time, so does the coral. If not, it doesn’t. The Montiporahas an entirely different and extremely interesting strategy. Instead of sitting on its haunches waiting for its zooxanthellae to again become productive, it begins to gorge itself on zooplankton! When bleached M. capitata increases its rate of zooplankton feeding up to five fold—enough to completely make up for the energy no longer coming from its zooxanthellae (Grottoli et al., 2006). When bleached but given access to natural zooplankton Montipora capitata is able to maintain its fat reserves, eventually switching back to a more autotrophic lifestyle as its zooxanthellae recover. We are very often told by other aquarists, we may tell other aquarists, and we may genuinely believe in the importance of light for SPS corals and place relatively less importance of food. A system that generalizes so broadly is bound to be mistaken much of the time. Both of these corals are classical SPS corals, but they utilize very different strategies for getting by in the world. Diversity is the rule here. When is an SPS coral not an SPS coral? I would suggest that they aren’t most of the time. Corals are simply far too diverse, far too variable among species and within species for such a broad categorization to tell us something particularly useful about them, or how to care for them. It is too much a generalization to say that corals do this, or corals are like that, and splitting them into SPS, LPS, or even soft corals really does nothing to improve the situation. While I am confident we as a hobby will continue to call them SPS and LPS corals for quite a long time, I hope that more and more of us consider the relative uselessness of such terminology in understanding their biology and developing their husbandry in captivity. When we want to talk about corals, and especially when we want to talk about husbandry and habits, polyp size isn’t even the tip of the iceberg. Instead, we are much better to be as specific as possible when discussing different corals in terms of husbandry and habits, and avoid thereby avoid overgeneralizing. Conclusion Corals are very ancient animals indeed. Since long before vertebrates walked on land different types of corals have bloomed and declined in the world’s oceans. The rugose and tabulate corals built incredible reefs during a period spanning hundreds of millions of years, but also experienced multiple declines, eventually culminating in their extinction at the Permian-Triassic extinction. About 10 million years later, the scleractinians were the newcomers on the scene. They had their own growing pains for tens of millions of years, blooming and declining themselves. Around 87 Mya one group of stony corals stopped calcifying altogether, leading to today’s mushroom polyps. All sorts of corals though, whether soft, stony, fire, or otherwise have continued to evolve and diverge, as they continue to do today. They have radiated to fill an incredible number of niches, many of which are so subtle we could easily miss them without looking closely. You see, I think I’ve had the right idea all along. Look closely at those corals, stare at them. Find their secret niches, and love them all the more. Photos by Jonathan Hale, unless otherwise noted.